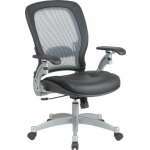 It isn&apos;t easy sitting in an office all day...unless you are in an ergonomic chair from Hertz Furniture. What is an ergonomic chair? Ergonomic chairs are computer chairs that have multiple adjustments for a custom fit. We have hundreds of office chairs in all sizes, colors, and types which makes Hertz the place for one-stop office shopping. Glide to your desk on ergonomically-designed task chairs, conduct meetings in executive office chairs, invite staff members to use leather conference chairs, and seat your clients on comfortable guest chairs. Now you can sit back, relax, and enjoy your office. Hard-working employees and executives deserve to sit in comfortable office chairs. Comfort begins with great padding and contours, and it doesn&apos;t end when the five o&apos;clock whistle blows. 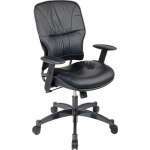 Ergonomic office chairs will serve you well long after you have left your place of employment. Why should I buy an ergonomic office chair? If one sits in an uncomfortable or inappropriately-adjusted office chair, they can experience back and knee pain, both in and out of the office. However, when you sit properly throughout the workday, you avoid the back, neck and knee problems that plague so many professionals. Seating which promotes correct posture also increases productivity and minimizes the distractions of aches and pains. The less one is distracted by back and knee pain, the more one can accomplish throughout the workday and beyond. Everyone deserves go home without physical pain at the end of long workdays, whether you are a company president, school principal or administrative assistant. 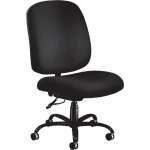 There are a few different design elements that characterize a swivel chair as ergonomic. It should have an adjustable backrest, tilt and arms. This will enable professionals to set the back and armrest at the perfect height for their bodies. Because every person is built differently, ideal back and arm heights vary. Pneumatic height adjustment is critical as well. Together with an adjustable tilt angle, it enables one to modify task chair proportions so feet are planted flat on the ground and knees are at the appropriate angle. 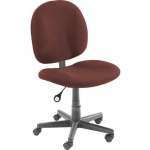 Do I need a chair with lumbar support? In addition to the previously mentioned ergonomic design elements, some believe that contoured lumbar support is critical for supporting the lower back and avoiding muscle pain. Great lumbar support is provided by a contoured extrusion that lends support to your natural spine curve. It is particularly beneficial for those who spend many hours working at a computer. Seats with good lumbar support keep the back properly aligned, which prevents muscle stress and lower-back injuries. However, while some believe this chair design element is essential, others say that a more basic design provides greater comfort and support. What kinds of office chairs are there? Office chair design has many variations so it&apos;s a good idea to familiarize yourself with the options before you make a purchase for your school principal&apos;s office or reception area. One element that varies is whether there are armrests or not. While you might think that armrests are always preferable, there are quite a few benefits to armless task chairs. If you have a low desk upon which you generally rest your elbows, or a pullout keyboard tray, the armless option is a great choice. A keyboard tray serves the same ergonomic function as armrests, so if your desk has one, you can purchase an armless model without having to compromise on comfort or health. Task chairs without arms also save money and won&apos;t get in the way when you want to stand up and move around. You don&apos;t necessarily have to purchase a model that is designated as armless to enjoy the benefits of this design feature. 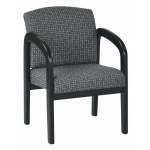 Most task chairs have removable armrests which allow you to transform any model into an armless one. What kind of upholstery should I get for my office chair? Office chair upholstery comes in a variety of colors and materials. Fabric-upholstered seating enables you to add color and style to your work space, and often features cushy foam padding. Alternatively, mesh seating options are more breathable and flexible. They allow maximum air circulation and prevent you from getting hot and sweaty. Leather office chairs will give any workplace a luxurious professional appeal. The classic design of dark leather projects a high-class image that is sure to impress clients. If you are on a tight budget but like the look of leather upholstery, vinyl is a more budget-friendly alternative. Dark vinyl creates the visual appeal of leather at a significant price reduction. Vinyl office chairs are great money savers, and are very easy to clean. There are many benefits to purchasing a mobile office chair. Rolling casters make it easy to slide from one side of a U-desk to the other, or roll back and reach auxiliary storage in nearby file cabinets, bookshelves or credenzas. When you are not seated, rolling casters simplify transport, whether you are moving chairs into storage or relocating to a new space. However, if you are planning on remaining seated in one place, you may choose a stationary seating option. For those who remain in one position throughout the workday, models without casters eliminate the inconvenience of chairs that slide around and move unintentionally. With so many design features and style variations, make sure to select the executive office chair that appeals to you. Choose a luxurious style to enhance your personal workspace or a modern office chair to update your school office. You can even coordinate office chair upholstery to match the color scheme in your workspace. The right executive chair will exude professionalism and confidence, projecting dependability, reliability and consistency. There are a few different design elements that characterize a task chair as ergonomic. It should have an adjustable backrest, tilt and arms. 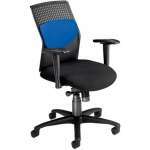 This will enable professionals to set the back and armrest at the perfect height for their bodies. Because every person is built differently, ideal back and arm heights vary. Pneumatic height adjustment is critical as well. Together with an adjustable tilt angle, it enables one to modify task chair proportions so feet are planted flat on the ground and knees are at the appropriate angle. Choosing the right office chair is simply a matter of exploring all of the options and deciding which features appeal to you. There are high-quality task chairs to suit any budget. Task chairs with casters are versatile, convenient and available in a range of prices. When you purchase an office chair from Hertz Furniture, you get the benefits of low prices as well as a complementary extended warranty.